Sasha comes to the Boys and Girls Club of the Sandhills every day after school. She likes to do arts and crafts, go in the computer lab, and play basketball in the gym. Her favorite part, though, is the warm meal. Sasha, like many of her friends at the Boys and Girls Club, doesn’t always have food at home. For her and 437 other kids, The Boys and Girls Club of the Sandhills is a security blanket, a place they can get help with their homework and play with their friends. For their families it’s a dependable source of healthy food. Today is an extra special day for Sasha and the hundreds of kids at the Boys and Girls Club. Today they and their families will enjoy a full Thanksgiving dinner with all the traditional fixins. Sasha stands on her tip toes as she peers through a window into the gymnasium. She’s watching volunteers set up the holiday buffet line. She sees a big pot of gravy, slices of pie, and the turkey. “They already started! I hope my mom gets here soon!” She rubs her stomach as she walks toward the front door. She’s got curly hair and it bounces with her small, animated steps. Inside the gymnasium, fall trimmings line long tables. Volunteers stand along a row of warm holiday dishes, scooping out heaps of sweet potatoes, stuffing, green beans, macaroni and cheese, gravy, and slices of turkey. The kids move through the line, wide-eyed as they try to balance their heavy plate in their small hands. Families sit down to have Thanksgiving dinner together, and the room fills with smiling faces and the aroma of good food. Sasha and her mom fill up their plates with a Thanksgiving meal. The Boys and Girls Club of the Sandhills, like all of our Kids Cafes, provides a valuable service to the community year-round. Not only do they feed children a healthy meal, but they help them with their school work, facilitate a safe learning environment, and give the kids a chance to play with their friends. 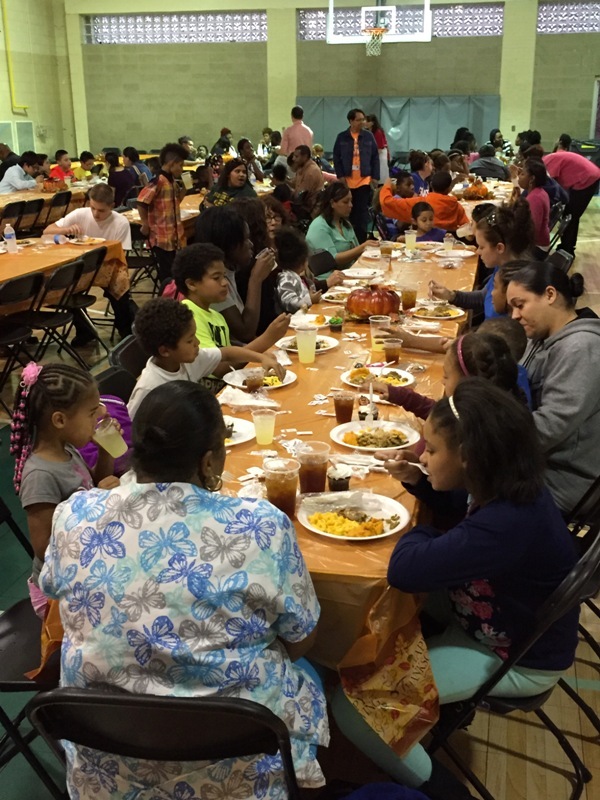 But this Thanksgiving meal means even more to the families they serve because it makes the holiday special. And yet, at the same time, it also makes it just like everyone else’s. For these kids and their families, this meal allows them to take part in the tradition that we all enjoy with our families around the dinner table this time of year. It’s a shared experience that every kid, grandparent, and family deserves to have—a meal that replenishes our spirit, and for which we all give thanks. Sasha and her mom left the Boys and Girls Club with full bellies and happy hearts after sharing a special meal together. And isn’t that what Thanksgiving is all about? 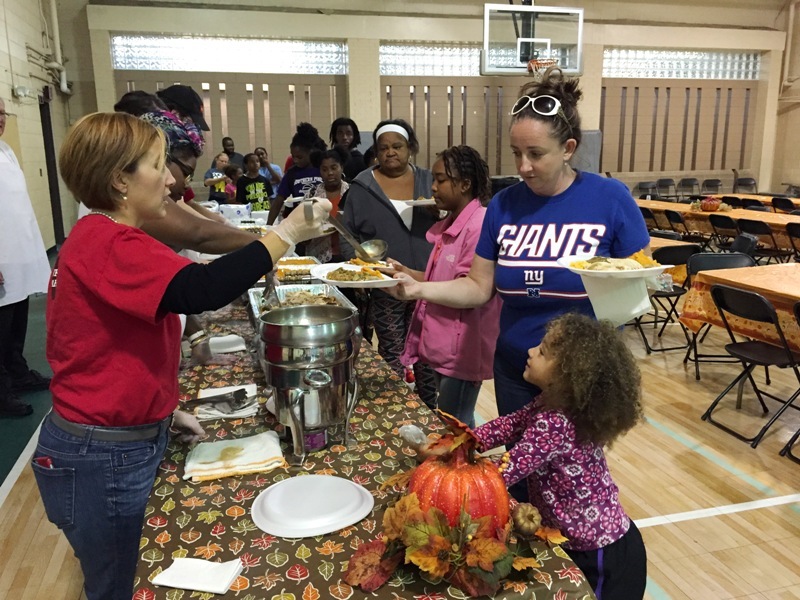 The Boys and Girls Club of the Sandhills, like many of our partner agencies and child nutrition programs, works hard to provide holiday meals to food insecure children and their families. We thank them for their service and wish everyone a pleasant Thanksgiving shared with friends and family. If you’d like to help make a difference this holiday season, give to our Holiday Meals Drive to help ensure our community partners have stocked shelves and warm meals for local families. *Sasha’s name has been changed to protect the family’s privacy.